Men In This Town Highlights Male Beauty. A new photo book provides over 250 pages of delicious eye candy from Australia to Italy. Giuseppe Santamaria's new book, Men In This Town: London, Tokyo, Sydney, Milan, New York, is 256 pages of the world's best-dressed men, strutting in the world's most glamorous cities. Santamaria's pictures show what styles proliferate where: e.g., tailored suits in London, rock style in New York, fitted jeans in Sydney. The fashionistos show that male beauty and fashion don't have to take a back seat to the ladies; we can all strut like peacocks. OUT Traveler [one of] the best of the new glossy fashion book hitting shelves this season Manuscript Men in This Town is a uniquely presented portrayal of the modern mans sartorial style. Through interviews and observations, Santamaria allows us to get to know a variety of creatively dressed men in their natural habitats. Candid street shots capture the eccentric and intriguing trends of each region, taking us on a journey across the globe to explore how each culture s traditions impact the way men dress. Kilgore Trout Featuring profiles of menswear enthusiasts from each of the five showcased cities, Men In This Town masterfully gives a face to the stylish individuals...paints a vivid portrait of men s fashion across the globe, ranging from timeless classics like a crisp button-ups and blue jeans, to tailored eccentrics, sporting butterfly prints and polka dot blazers. Santamaria doesn t shy from reality; he captures the favored styles of the cities inhabitants and, in doing so, captures a piece of the culture of each urban center. This photographic volume will appeal to men s fashion enthusiasts, and offer them an organic flavor of the dapper everyman and the city he inhabits. Life + Times" "Men In This Town" Highlights Male Beauty. A new photo book provides over 250 pages of delicious eye candy from Australia to Italy. Giuseppe Santamaria's new book, "Men In This Town: London, Tokyo, Sydney, Milan, New York, " is 256 pages of the world's best-dressed men, strutting in the world's most glamorous cities. Santamaria's pictures show what styles proliferate where: e.g., tailored suits in London, rock style in New York, fitted jeans in Sydney. The fashionistos show that male beauty and fashion don't have to take a back seat to the ladies; we can all strut like peacocks. "OUT Traveler" [one of] the best of the new glossy fashion book hitting shelves this season " Manuscript Men in This Town "is a uniquely presented portrayal of the modern mans sartorial style. Through interviews and observations, Santamaria allows us to get to know a variety of creatively dressed men in their natural habitats. Candid street shots capture the eccentric and intriguing trends of each region, taking us on a journey across the globe to explore how each culture s traditions impact the way men dress. " Kilgore Trout " Featuring profiles of menswear enthusiasts from each of the five showcased cities, "Men In This Town "masterfully gives a face to the stylish individuals...paints a vivid portrait of men s fashion across the globe, ranging from timeless classics like a crisp button-ups and blue jeans, to tailored eccentrics, sporting butterfly prints and polka dot blazers. Santamaria doesn t shy from reality; he captures the favored styles of the cities inhabitants and, in doing so, captures a piece of the culture of each urban center. This photographic volume will appeal to men s fashion enthusiasts, and offer them an organic flavor of the dapper everyman and the city he inhabits. "Life + Times"" ""Men In This Town" Highlights Male Beauty. A new photo book provides over 250 pages of delicious eye candy from Australia to Italy. Giuseppe Santamaria's new book, "Men In This Town: London, Tokyo, Sydney, Milan, New York, " is 256 pages of the world's best-dressed men, strutting in the world's most glamorous cities. Santamaria's pictures show what styles proliferate where: e.g., tailored suits in London, rock style in New York, fitted jeans in Sydney. The fashionistos show that male beauty and fashion don't have to take a back seat to the ladies; we can all strut like peacocks." -"OUT Traveler" ..". 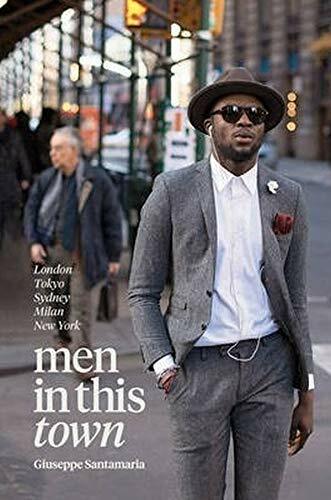 [one of] the best of the new glossy fashion book hitting shelves this season..."" -Manuscript "Men in This Town "is a uniquely presented portrayal of the modern mans' sartorial style. Through interviews and observations, Santamaria allows us to get to know a variety of creatively dressed men in their natural habitats. Candid street shots capture the eccentric and intriguing trends of each region, taking us on a journey across the globe to explore how each culture's traditions impact the way men dress."" -Kilgore Trout ""Featuring profiles of menswear enthusiasts from each of the five showcased cities, "Men In This Town "masterfully gives a face to the stylish individuals...paints a vivid portrait of men's fashion across the globe, ranging from timeless classics like a crisp button-ups and blue jeans, to tailored eccentrics, sporting butterfly prints and polka dot blazers. Santamaria doesn't shy from reality; he captures the favored styles of the cities' inhabitants and, in doing so, captures a piece of the culture of each urban center. This photographic volume will appeal to men's fashion enthusiasts, and offer them an organic flavor of the dapper everyman and the city he inhabits." -"Life + Times"
From the streets of the leading fashion cities around the world, photographer, art director and blogger Giuseppe Santamaria brings together a striking photographic collection showcasing the styles of the modern man.